It is very possible that young fans familiar with Nat Adderley through his recent work with brother Cannonball wouldn't recognize him on this LP. 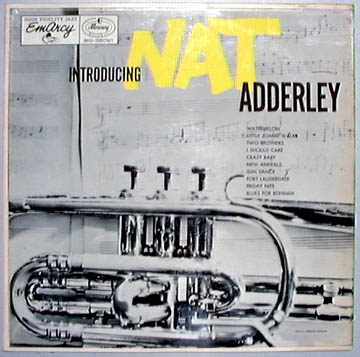 Music has changed considerable since the Adderley brothers were the talk of New York in the summer of 1955 and then there is Nat's ability to sound like so many other people. Nat's favorite players have long been Dizzy Gillespie, Miles Davis and Clark Terry. He can intersperse characteristics of each player in the course of a solo much the way a good comedian can integrate impressions into his act. But the crackle and fire are all Nat's. The music on this LP is representative of the best modern jazz of the time. The brothers were more into playing than they are now and the reputations that they established among musicians are largely the result of early sessions like this. Shortly after the release of this LP, Cannon would form his first quintet. The sledding would be rough and the group would break up with Nat joining J. J. Johnson and Cannon going with Miles Davis by 1958. They would reform in the fall of 1959 and shortly thereafter would score with "Dis Here". Since that time the brothers have been together at the top. Nat has continued to record under his own name sometimes with Cannon and sometimes without. His sessions, and for that matter, Cannon's, feature his outstanding compositions. While his tunes here are not as well known as "Work Song" or "Jive Samba" they are well representative of his ability. In addition to the Floridians, the rhythm section is beautiful throughout this LP. Horace Silver was working with Art Blakey, Paul Chambers with Miles Davis and Roy Haynes with Sarah Vaughan when these sides were done, but each has left his mark on the music. It is the only time these three giants ever recorded together. The late Paul Chambers has left us a legacy of brilliant recordings and he never sounded better than he does here. 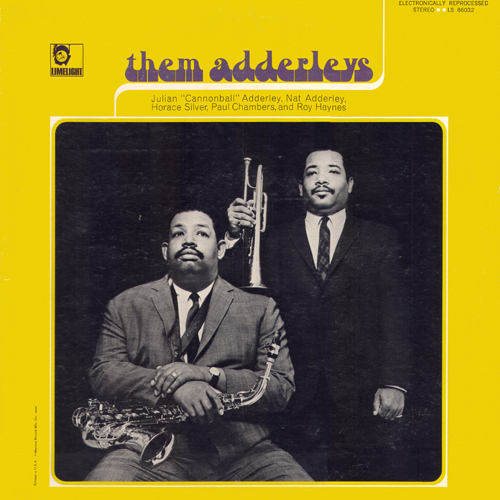 1955 was a very good year for modern jazz and a very good year for Nat Adderley. Come join him, his brother and this monster rhythm section and enjoy some fine swinging music.